Gerardus Mercator (Gerhard Kremer, 1512 - 1594) was a cartographer, philosopher and mathematician. He is best known for his work in cartography, in particular the world map of 1569 based on a new projection which represented sailing courses of constant bearing as straight lines. 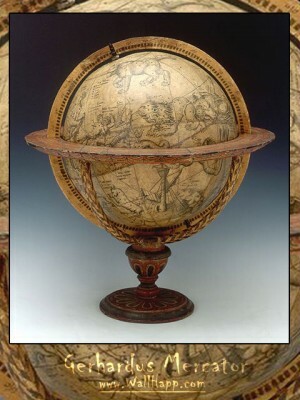 He was the first to use the term "atlas" for a collection of maps. The Mercator projection is a cylindrical map projection presented by the Flemish geographer and cartographer (Cartography or mapmaking, has been an integral part of the human history for a long time, possibly up to 8,000 years) Gerardus Mercator in 1569. It became the standard map projection for nautical purposes because of its ability to represent lines of constant course, known as rhumb lines or loxodromes, as straight segments which conserve the angles with the meridians. While the linear scale is equal in all directions around any point, thus preserving the angles and the shapes of small objects (which makes the projection conformal), the Mercator projection distorts the size and shape of large objects, as the scale increases from the Equator to the poles, where it becomes infinite.